At this point, you know what your Daily Calorie Cap is. To lose weight, you cannot take in more calories than your Cap. And one of the biggest frustrations in losing weight is that people eat a lot more calories than they think. We’ll give you some tools on how to avoid this mistake. So, how will you make sure you do not consume too many calories? Here are some good suggestions…. Use the Calorie Counter Wheel that your doctor gives you. Carry it with you. It gives you the number of calories for many different foods and snacks. Be careful not to exceed the serving portions noted on the wheel. If a 4-ounce food item is 100 calories and you eat 6 ounces, then you have taken in 150 calories. Also, remember that the calorie wheel only gives you an “idea” of how many calories are in food items. The actual number of calories my often vary, especially if a food item has lots of sauces and dressings. You can also click HERE to use an online tool that provides the calorie count of many foods. I pledge to start eating a healthier diet today! 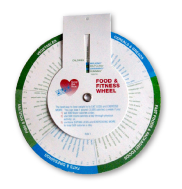 Sometimes a food item may not be on the Calorie Wheel, you may not have the wheel with you, or you may be eating at a person’s home and don’t want to pull out a Calorie Wheel and start using it when the main course is served! The Visual Portion Guide will help you more accurately estimate the portion sizes of the food you eat. Try to memorize the pictures, but you may want to carry it with you. 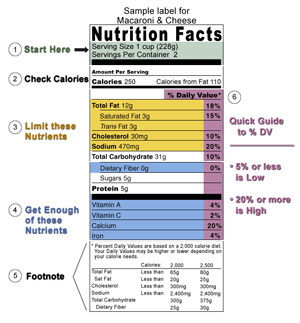 Know how to read labels so you will know how many calories are in the items you consume. Also, make sure you know how many servings a container of food has. In the label below, you see that the food label says a “Serving Size” is 1 cup. The container has 2 servings and each serving has 260 calories. So, if you eat everything in the container or carton, then you’ve eaten 520 calories and not 260! You have to multiply the number of servings times the number of calories per serving. Some containers, cartons or cans may have 3 and even 4 servings! Now that you have learned ways to count calories using the tools we’ve described, you need to add up all those calories so you do not go over your daily and weekly goals. So, you need to keep a log for awhile to help you keep track of the calories you eat. Click here to see a one-day copy of the Daily Calorie Log. You can make some copies. You’ll be surprised how quickly you learn to use the Calorie Log. Record the calories of everything you eat. Record it right after eating because you are more likely to forget what and how much you ate the longer you wait. Remember: one of the big problems in weight loss is that people eat a lot more than they think. The Daily Calorie Log will keep you on track. KNOW WHERE YOU STAND FOR THE DAY’S CALORIE COUNT. Look at your Calorie Log during the day. Know exactly how many calories you’ve eaten so far each day. Then, you’ll know how much more you can eat the rest of the day, how much you can eat at dinner, or whether you can have that night-time snack! The Calorie Log will help you “bank calories if you want to “save up.” Let’s say it’s Sunday and you are going to a party or special dinner the next Sunday and you know you’ll eat more than you should. So then you “Bank” some calories at the beginning of the week. If you go over your Daily Calorie Cap, then cut back the next week. In the same way, let’s say you want to save up for a special dinner that same night. Then, you can eat less during the day. Exercising will help you lose a little weight but it is best for keeping off those pounds you worked so hard to lose. Exercise is also good for your overall health – especially for reducing risks for cardiovascular disease and type 2 diabetes – and it’s good for your overall mental health. Start out by eating less, and after you’ve lost some weight, then you can start exercising. Start exercising slowly and increase the amount slowly. If you are already exercising, don’t stop! Please talk with your doctor about exercising. Find a weight loss partner so the two of you can support one another, especially when there is temptation to eat too many calories. Talk with family and friends about your weight loss program and ask their cooperation. Tel them that offering food to you only serves to ruin your weight loss progress. Tell them that they can eat in front of you. Offering food to you may be their way of showing concern and love, but assure them that you are fine and they can show their concern by not offering you food. Tips for the family: do not threaten or insult; do not avoid social situations because of the person’s weight; do not lecture or criticize; encourage; forgive and even ignore lapses. Review your past attempts, if any, to lose weight, and see what went wrong and what helped you. Learn from your past success and failures. Hiding snack foods forces you to think about whether you should eat them and gives you a chance to change your mind. Store high-calorie food out-of-sight, behind other foods, on a high shelf. Eat in one place and do nothing else at that place. This way you will get used to eating only in place. Do nothing else while eating. Do not weaken the pleasure of eating by mixing it with other activities. Pay attention to how every bite tastes. Calories should be tasted not wasted. Eat s-l-o-w-l-y. Eating fast fools your body into thinking it has not had enough to eat so you don’t feel full… and then you eat too much! Put your fork down between bites; chew your food and then pick up your fork after you swallow. Pause at some point during your meal. Think about what you’ve been eating and the amount of calories. These actions will help you slow down, which will give your brain time to tell you you’ve eaten enough. The 5-Minute rule. Wait 5 minutes before going back for extra helpings. This pause helps you slow down eating and gives you more time to decide how much additional food you really need. Do NOT clean your plate. If you do, you will be more likely to stop eating only after your plate is empty and not when you reach your New Daily Calorie Cap. Remove serving dishes from the table after the first serving is made. Store leftovers right after eating or even right after you put food on your plate. Having the food handy is asking for trouble. Leave the table after eating, which limits the time you are exposed to the food. When a craving hits you, do something else or think about something else to distract you and after a short while the craving will pass. Listen to music, read, go for a walk, call a friend, drink some water, take a hot bath, work on your hobby. Find your triggers: do you eat at a certain time of the day? 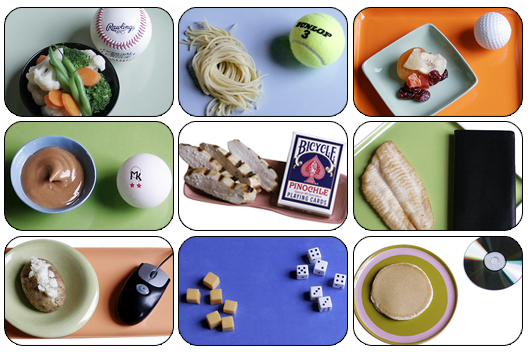 Do you eat when you’re bored or depressed, anxious, or angry? What do you do when you eat? Watch TV or read a newspaper, or surfing the internet? What kinds of foods do you crave? Identify your triggers and you will be able to predict an on-coming trigger and adopt distractions to keep you from overeating or over-snacking. If you do snack, take a small portion. For example, eat a half container of yogurt and return for the second half if you want it. This technique helps you to stop automatic eating and separates hunger from habit. Eating breakfast helps to lower your desire to eat too many calories later in the day. If you are going out to a restaurant that night, then eat less during the day so you can “bank” some extra calories. Restaurants can really ruin your daily calorie cap. So, order from the appetizer or salad section of the menu. Order a la carte instead of a full meal; many times you end up ordering and paying for food that you never would have eaten. Share meals or get a doggie bag. Watch the salad dressing so ask for it on the side. Beware of rich sauces, oils, and breaded and fried foods. Alcohol is loaded with calories. Get the small order of fries, not the big one; order a single cheeseburger, not the double cheeseburger; order the small soda not the super size. Get dessert only if you are hungry or if you have already planned it in your day’s calorie cap. Avoid going past fast food restaurants when you’re hungry. Avoid the food court at the mall. If you do go way over your New Daily Calorie Cap because you ate at a restaurant, don’t beat up yourself and certainly don’t give up. These things happen. Just eat less the next day. Expect challenges to your efforts to lose weight, mostly during the first few weeks. Review some of the tips above to help you be strong, including distractions. You may also be a little “out of sorts” such as being in a bad mood or having difficulty in concentrating, which will become less noticeable. So, prepare yourself. Don’t mix up lapse and relapse. Everyone has a lapse…you go over your New Daily Calorie Cap once in awhile. But, prevent an occasional lapse from becoming a relapse where you always go over your cap. Avoid Loser Thinking, which says that if you eat too much one day, you are a failure and you will never lose weight; so, you feel like you should quit. Don’t. Just get back on track tomorrow. When you’ve lost some weight, reward yourself, but not with food. Instead, stay in bed late, buy yourself something, attend a sporting event, go to a movie, etc. Fill a jar with the money you would have spent on snacks and buy something at the end of the month. Many people slowly regain the weight they have lost. Here are some tips on how to keep off those pounds. First, make sure that your Daily Calorie Cap is accurate. Now that you have lost some weight, most likely your Calorie Cap is lower than when you started your diet. Ask your doctor to help you find your new calorie cap. Exercise is one of the best ways to keep from regaining those lost pounds. Eat a healthy diet. Ask your doctor for suggestions on healthy diets or ask to sit with a nutritionist who can help you identify different diets that will be tasty and low in calories. Continue to use the tools in this packet, such as the Calorie Wheel and the Picture Portion Guide and reading food labels. You may need to start using the Calorie Log if you are re-gaining weight because the Log will help you keep track of how many calories you are eating. Keeping yourself at a healthy weight is a life-long commitment.